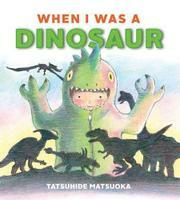 An imaginative young Japanese child receives a birthday gift that any kid would covet—a dinosaur suit! The child wears the suit to the park to show the other children, but they are frightened and scatter. This is when the dinosaurs arrive. They show the child a secret tunnel from the park to their home in Dinosaur Land. Many varieties of dinosaur make an appearance on Herbivore Island to play, including the Iguanodon, the Brachiosaurus, and Pterosaur taxis. However, the carnivores are not far away. When a “pack of Tyrannosauruses” heads to Herbivore Island, the child comes up with a plan to mobilize the dinosaurs and fight the carnivores away. From the storyline to the child’s suit, this (uncredited) English translation of the Japanese Boku ga kyoryu data toki is reminiscent of Where the Wild Things Are, though less enchanting. The busy illustrations offer multiple perspectives of Dinosaur Land, giving readers much to explore. Both the friendly herbivores and the villainous carnivores are depicted foraging and hunting, respectively, placing their different diets in stark contrast. Mild violence is employed as the herbivores fight to protect themselves. The final double-page spread offers a charming twist when the child emerges from Dinosaur Land and the other dinosaurs are revealed to be other children in their own dino suits.